Eggplant (Solanum melongena), native to India and Southeast Asia, is known by different names such as Aubergine, Melongene, Brinjal (in UK, Australia, USA, India, South Africa, Malaysia, Singapore, and West Indies), Baingan or Baigan (in India), Garden egg, Japanese eggplant, Chinese eggplant and Guinea squash. Technically eggplant is a fruit, botanically classified as a berry, but in the culinary world it is treated like a vegetable. It contains several small edible seeds with bitter taste. All part of the eggplant including its seeds and skin are edible. Learn how to grow eggplant from seeds in containers or garden beds, including the eggplant varieties, pollination and insects and diseases. It is easy to grow eggplants at home. You can start from seeds of seedlings. You will be able to harvest fresh eggplants in about 15 weeks after sowing the seeds. Different varieties of the plant produce fruit of different size, shape, and colour. Colours vary from white, yellow, green, reddish-purple, dark blackish purple, even red, bicolored with striping and bicolored with colour gradient. The larger Black Beauty varieties are the most common. They have smooth skin in a deep purple colour, and an oval shape with a green calyx. The shapes include oval, elongated oval, long tubular like cucumber, etc. They can be as small and round as an egg, long and thin like a cucumber, or large and oblong in shape. In India, miniature varieties of size about 5 cm oval and larger varieties weighing up to a kilogram (2.2 pounds) are grown. The Indian baby type is small, a few inches long, round egg like shape, with smooth, dark purple skin and a green calyx. The eggplant is a perennial plant in tropical and annual in temperate climates. The plant grows to a height of 40 to 150 cm (16 to 57 inch). 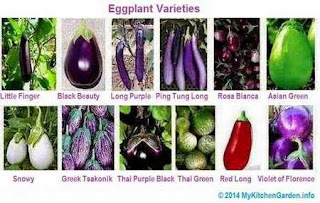 The following pictures show the different kind and varieties of eggplant. People often wonder, why it is called eggplant. The name of eggplant was given by Europeans in 1700s, because of its shape and size similar to a goose egg or hen's egg. In those years, the eggplants were yellow / white in color and the purple color eggplants came afterwords. Position: Where To Plant Eggplant? Eggplant needs a sunny locations and need a warm soil for at least three months. Growing eggplants in cold soil or cold weather will have insect and disease problems. In places with constant cool climates, grow the plants in large, dark-colored containers. To reduce pest problems, choose a spot where tomatoes, peppers or eggplants have not been grown in last 2 years. Eggplants can be grown in garden beds and pots as well. Sometimes it becomes difficult to control pests and diseases when grown in garden beds. Eggplants can be grown in pots 18 - 24 inch wide. Dark-colored pots contain the heat inside. Sow eggplant seeds indoors about six weeks before the climate begins to warm up. The seeds germinate best at temperatures above 24 deg C (75 deg F), so keep in a warmer place inside the house. You can use bottom heat to maintain a soil temperature around 24 deg C for about 10 days. Sow seeds them about 10 mm deep in a seed raising medium. Soaking seeds overnight will promote germination. Alternatively, you can buy seedlings from the garden shop. Germinating eggplant seeds with paper towel: Soak the seeds in water and place on a damp paper towel. Fold the paper towel and enclose in a zip-lock bag and place in a dark place. Seeds will germinate in a few days, depending on temperature. The soil pH should ideally be from 6.3 to 6.8 . Two weeks before planting, make the soil rich by breaking the large clumps and adding composted cow manure. See details on how to prepare soil for gardening. Put a stack about 3 inches from the plants. Plant the seedlings at the same depth at which they are growing in their containers. Keep a distance of 18-24 inch (45-60 cm) between plants and 24-36 inch (60-90 cm) between rows as the eggplants grow into large plants that need plenty of space. Water well and apply mulch. Give plants a balanced liquid fertilizer every 3rd week. Purple Eggplants Grown from Seeds and hand pollinated. Apply a 2-3 inch layer of mulch to hold moisture in the soil. It will also avoide weeds and fungal diseases. I use a 2-3 inch layer of sugar cane mulch. When the plants bear fruits and grow bigger, the branches become so heavy that they begin to fall down. It is a good idea to tie the plants to stakes to keep them upright. Put a stake at the time of planting. Eggplants need good moisture in the soil so water the plants regularly, otherwise the eggplants will be bitter and smaller. Do not over-water to make the soil soggy. Allow the soil to dry slightly between watering to discourage wilting. I feed the plants with a balanced liquid fertilizer or compost tea every third week after the plants bloom. Eggplants planted in containers need to be fed regularly. Remove the old and unhealthy leaves as and when you notice them. Eggplant requires no pruning except when the plant is young, you can prune the tips of the branches to encourage the growth of new fruit-bearing branches. If your plant has survived till the next season, you can cut it back by half its size to stimulate the growth of new branches. Eggplant flowers contain both female and male reproductive structures, so they are referred to as "perfect pollinators" and they self-pollinate within the same flower. However, the flowers are relatively unattractive to bees. Generally, your eggplant will pollinate themselves, but if you notice that flowers are falling off without producing eggplants, then you may need to hand-pollinate. Common pests of eggplant include the potato beetles, flea beetles, aphids and spider mites. Flea beetles are the eggplant's worst pest. The tiny pest flea produce several holes in the leaves. You may do the following to get rid of flea beetles. Mix 2 parts rubbing alcohol and 1 tablespoon liquid dish washing soap in 5 parts water and spray on the foliage of the plants. If planted in containers, put them on a table to keep them out of ground-dwelling flea beetles. Pick the black adults and the red or gray larvae and destroy them. Covering the ground with plastic prevents the insects from reaching on the leaves. A thick layer of mulch around plants will prevent larvae to become adult. Neem oil is effective at repelling flea beetles. Mix 1 ml neem oil in 1 litre water and a few drops of liquid soap and spray. I have used neem oil spray several times with success. A soil-borne fungus known as Verticillium wilt can cause eggplants to wilt and die. Pull up plants that wilt and collapse. To avoid this, grow your eggplants in containers filled with premium potting mix. Good sanitation and crop rotation practices can control fungal disease. Harvesting of brinjals at the right time is important. Baingan harvested at the right time will have firm and smooth flesh and small and soft seeds. The skin, flesh and seeds of an eggplant are edible. If overgrown or over-matured, the fruits will taste bitter and seeds will be large and dark and hard. It is difficult to pull the fruit by hand, so harvest it with pruning shears with some stem attached. You can store the picked eggplants at cool room temperature or in the refrigerator for several days.